The absolute best orchid sighting, without a doubt, is the thousands of blooms at the Atlanta Botanical Garden's annual Orchid Daze. 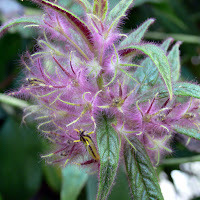 On opening day, I headed to the Garden after a tour of the new "Monsters, Demons, and Winged-Beasts" exhibit at the Michael C. Carlos Museum. It was cloudy that morning and sunny in the afternoon, so this itinerary worked out perfectly. I called a friend, the one who has called me his "cultural advisor" (he's quite the classy guy, so he's just being kind in saying that), to see if he wanted to play tourist with me. Also excited for a day of botany, we headed to the Garden. It's been about six months since I'd done any video and I have been anxious to get back to it. I broke out the video-capable iPod nano (which has mostly sat idle for the more than a year that I've had it) and recorded 68 mini-clips while touring Liquid Landscapes. Not quite the Ansel Adams of the video camera, I wanted lots of clips from which to choose. Enjoy! tourATLANTA now has its own YouTube channel, so expect to see more Travis-created tour videos in the not too distant future. And I suspect that they'll get better over time. Creativity for me is usually a process, with the occasional epiphany. We arrived at the Garden, got our tickets quickly, and entered through the Hardin Visitor Center where there was an Orchid Market going on. 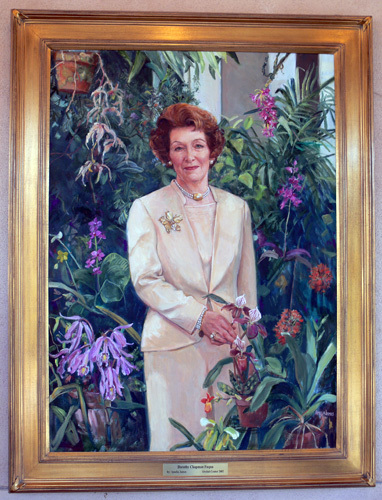 On sale were dozens of orchids and orchid art in the form of glass and paintings. I noticed on the way into the Garden that they had set up an Orchid Day Care, so if you made a purchase on your way in, you don't have to carry it around with you all afternoon. 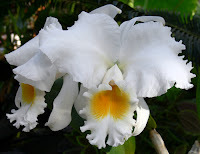 You can leave it with the Orchid Day Care staff and collect it on your way home. Very thoughtful, I thought. We mapped out our path of discovery placing the Orchid Daze: Liquid Landscapes exhibit in the middle of the exploration. My friend had not yet been on the Canopy Walk, so we did that first. It's beautiful in the summer, but in the winter you can see so much more of the city and nearby neighborhoods. 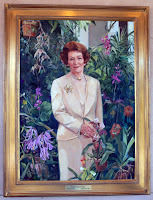 We made our way to the Fuqua Orchid Center, attached to the Dorothy Chapman Fuqua Conservatory. The crux of the Orchid Daze exhibition is here, but don't think it's a modest exhibit…there are thousands of orchid blooms throughout several "galleries." This year’s theme is "Liquid Landscapes"…and it's very cleverly done. 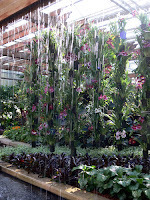 Although one often expects to see water features in a garden, the unique pairing of water in several of its manifestations, simple and complex, with the colorful floral specimens was achieved in this exhibit quite uniquely. 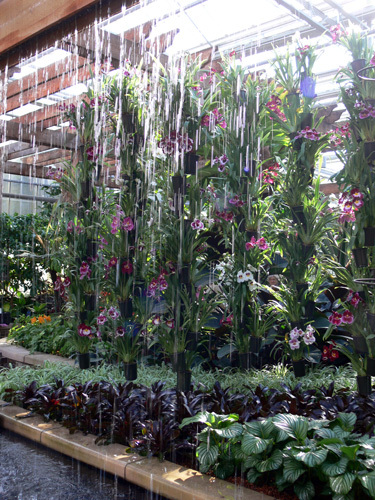 Water came in the form of waterfalls, a babbling brook, a still, calm pond, and the usual sprayers one sometimes forgets about that is continually misting the "Fuqua Jungle"…a part of the conservatory experience. 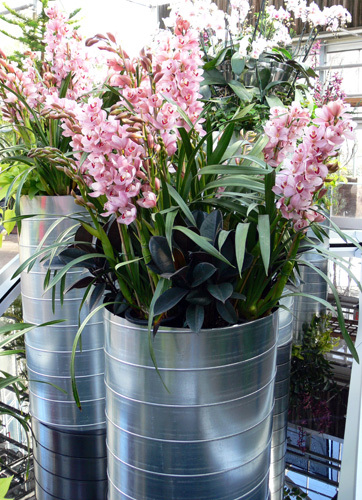 The displays also incorporated a number of "modern" features…giant tin vertical pipes for pots, for example. The marrying of elegant flowers, as is the orchid, with industrial materials was exquisitely done…I wouldn't be surprised to learn of visitors going home and trying something similar in their own gardens. Expect your camera lens to fog up when going into the exhibit, but not to worry…cameras tend to acclimate relatively quickly. I did find that our phone cameras and iPods did not fog up. I'm not sure if that was due to lack of surface area to hold the condensation or something else. Either way, I was able to shoot video well before I could start making photos. Speaking of multimedia, being there on opening day, I should not have been so surprised to see so many visitors with cameras and video cameras…I'm not actually sure if I can remember seeing a single person without a recording device of some sort. I was feeling very "at home." As it turned out, my touring companion was having a blast with his own camera. I believe we may have unleashed another Spielberg or Lucas. And I'm anxious to see the end product of what looked such an enjoyable creative process. As we explored the exhibition, we ran into people we knew (even as big as Atlanta is, you can frequently run into friends and colleagues, new and old). We also spoke with docents who were stationed at strategic points. Some of the docents were volunteers who could answer general questions about the Garden and others were actual Orchid Specialists. You'll recognize the specialists by their "Ask Me About Orchids" badges. All were very polite and eager to answer questions. I mentioned the Orchid Market. Others will be held on the weekends of March 5-6 and April 2-3. 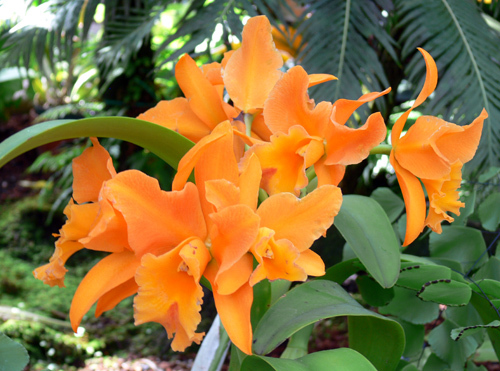 Every Saturday for the duration of Orchid Daze there will be Guided Exhibition Tours at 10:00 a.m. For the orchid-aficionado, or those wishing to become one, there will be Orchid Care Clinics on Saturdays March 5, and April 2. 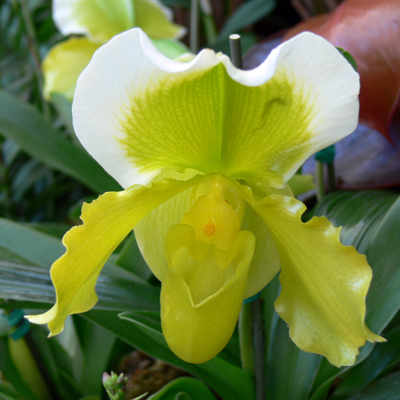 And the Orchid Society Show will take place Friday-Sunday, March 11-13. Do you even have to ask if I will return to the Atlanta Botanical Garden? It's one of my favorite places in the city. Sometimes I'll pop in and find a bench where I can peacefully read a chapter in a book. Sometimes I'll stop by for lunch, foregoing the crazy hustle and bustle of lunchtime in the city. And sometimes I'll stop in for a stroll to reflect on a decision I'm considering. 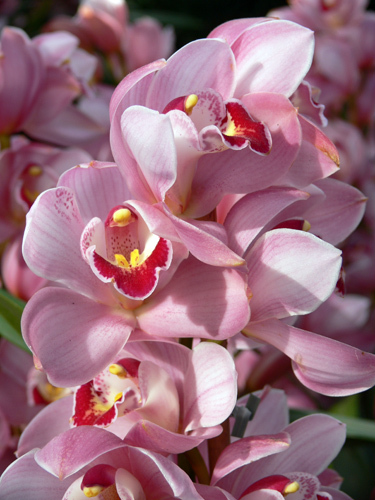 There are many, many reasons to return…Orchid Daze just happens to be one of the more beautiful reasons. Orchid Daze: Liquid Landscapes will be on exhibition through Sunday, April 10, 2011.